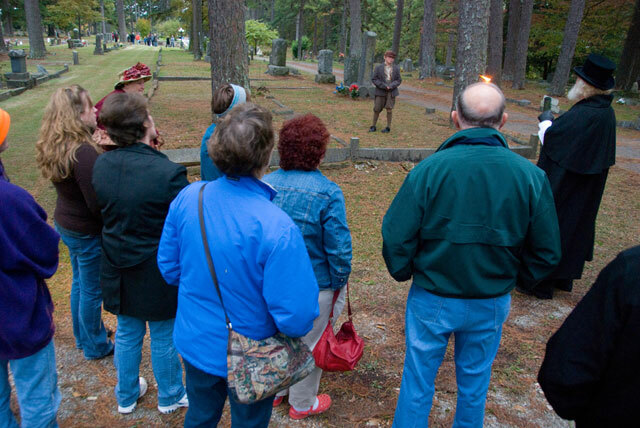 The Eureka Springs Historical Museum will host its 7th annual “Voices from Eureka’s Silent City” cemetery walking tours on Thursday, Friday and Saturday, October 15th, 16th, and 17th. Then again on Friday and Saturday, October 30th and 31st. The living history tours feature live actors in period costumes portraying early citizens of Eureka Springs. This year, actors and guides will be presenting compelling stories of some of Eureka’s former leaders in service and philanthropy who now reside in the Silent City, the Eureka Springs City Cemetery: A WWI Army Colonel, a socialite, a prominent lawyer/mayor, a descendant of a Native American Chief, and an early proponent of baseball, among others. I will be attending this event. It should be a fun, interesting experience. For more information and pictures from previous walks take a jaunt over to Eureka Springs Historical Museum! This entry was posted in Arkansas, Arkansas folklore, Arkansas stories and folktales, Eureka Springs, Haunted places, Historic Arkansas, Ozark Mountain stories and tagged Arkansas, Cemetery walk, Eureka Springs, ghost hunting, ghostly haunts, haunted Ozarks, Northwest Arkansas, paranormal. Bookmark the permalink. Tours like that are fascinating, and often surprise you. My wife and I took a tour of the New Garden Friends graveyard tour in Greensboro, NC, and saw where the poet Randall Jarrell is buried. His Death of the Ball Turret Gunner is one of the most powerful poems ever written about war. Agree, Mike, both with the tours and Jarrell’s work. Such depth in those few words. I hadn’t come across this poem before, I definitely would have remembered it. Thanks for highlighting it Mike and Jack. That last line is so powerful. Sounds like a fun, interesting and unique experience, Jack! That sounds like a tour you’d reallly enjoy, Jack. I can well see some of the characters from your ArkansasTales book popping up along the way. 🙂 I think I will enjoy it, milliethom. I’ve spoken to some who went last week and they enjoyed it. I just hope the weather holds up this coming Friday.